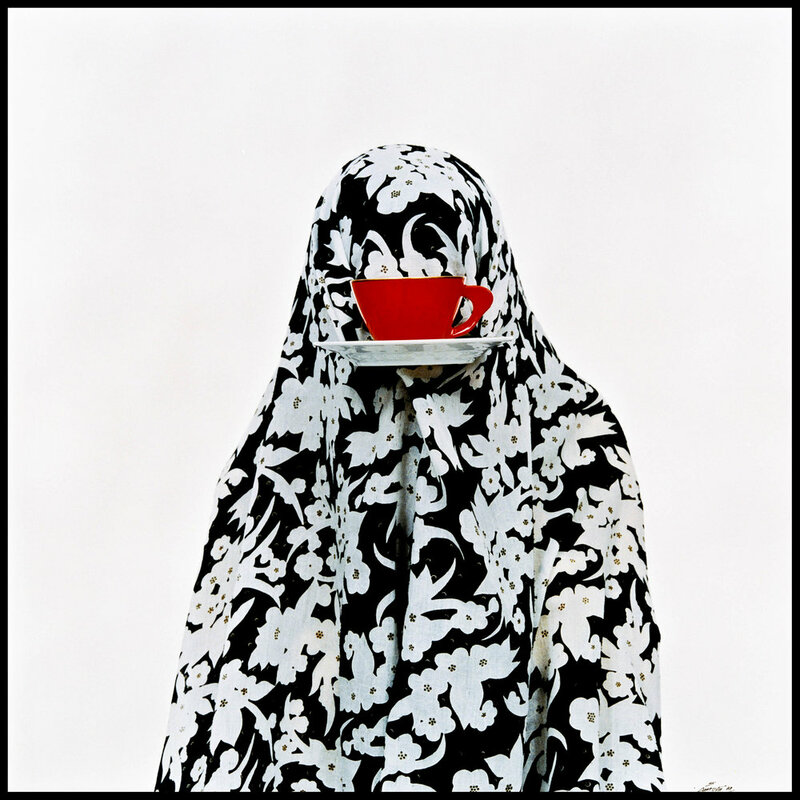 Shadi Ghadirian is an Iranian artist who has been noticeable on the world’s art scene for the last two decades. In her works she explores the symbolism of everyday routine, traces the connection of the epochs and reveals thoughts and feelings of contemporary Middle Eastern women. 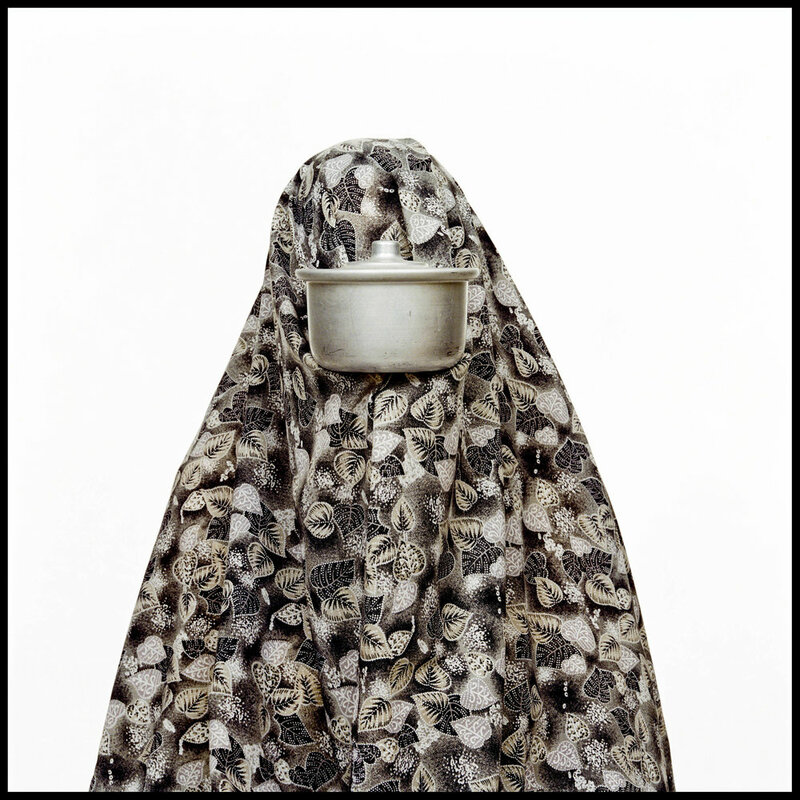 Over the time she has honed visual language that speaks to you clearly, despite all cultural or religious differences. We first ran into Shadi’s artwork at Photo London, where a shot from her Too Loud a Solitude (2015) was presented. It turned out that the picture we saw was a part of her video installation dedicated to the effect of the crowd. In this you can see an individual opposed to the rush and bustle of the vague human mass around. We decided to dig deeper and found out that Shadi is an established artist who has been sharpening her creative vision for decades, and one of the few who are shaping the contemporary female art scene of the Middle East today. 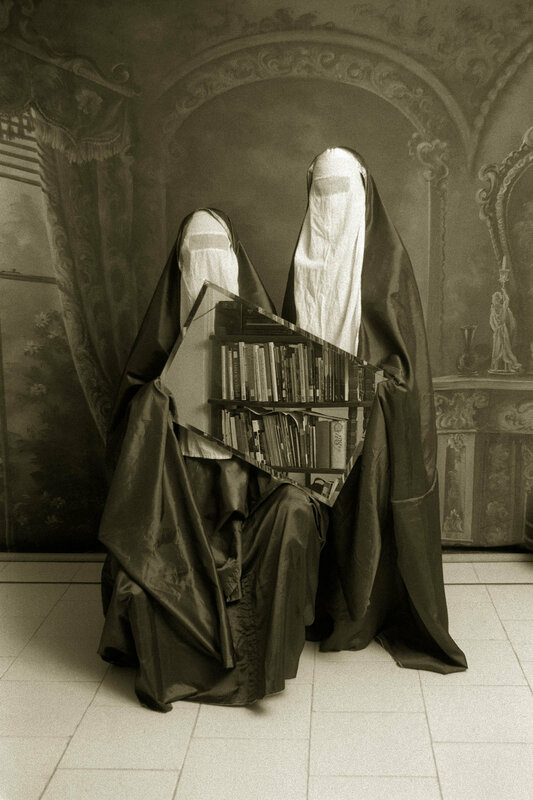 Shadi Ghadirian studied art and photography at Azad University in Tehran. 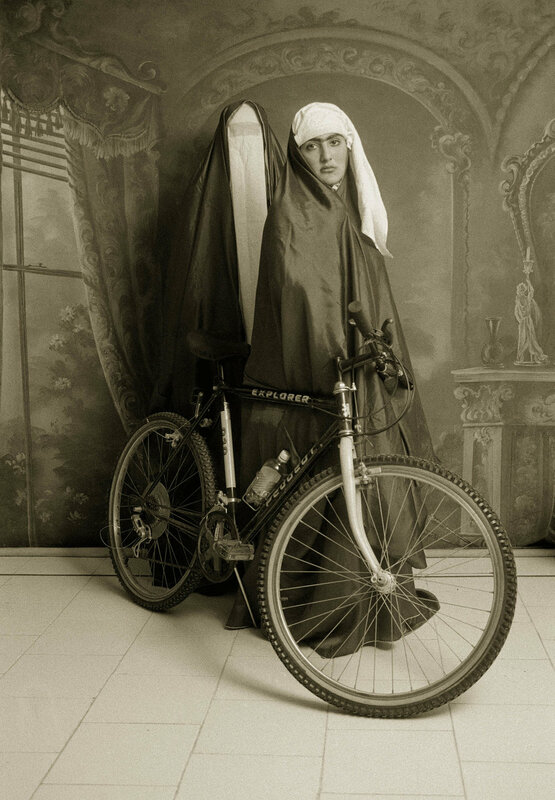 Her first photo series Qajar was presented in 1998. It depicted Iranian women put in the settings and dressed up in costumes of the Qajar dynasty era, a period of history of Iran from the late 18th to early 20th century. 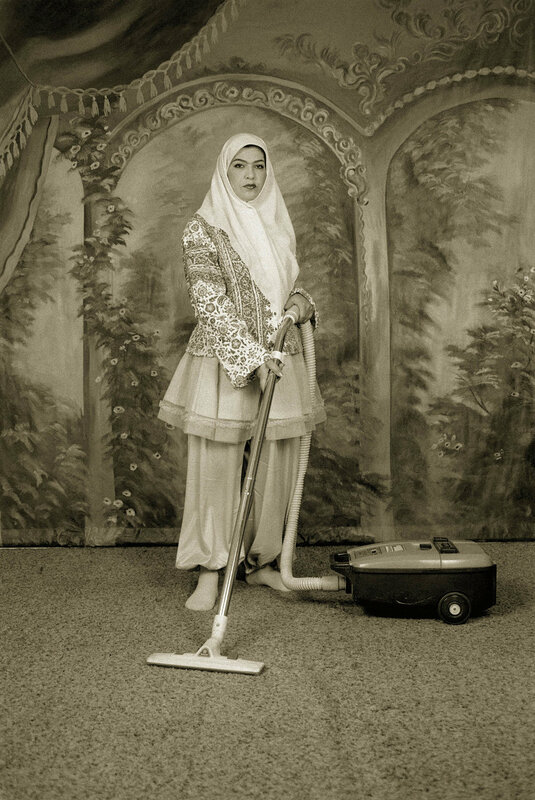 In the images traditionally dressed women are shown with the contemporary objects that are unusual or even forbidden for women in Iran, which resonates with the duality and contradictions of the everyday life in the Middle East. Shadi continued to develop this global concept in her next project. 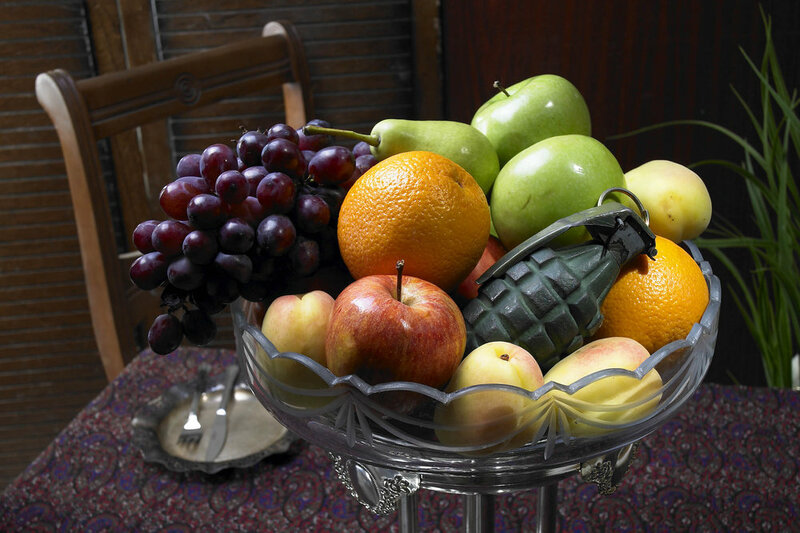 Qajar was followed by another series transmitting similar ideas and called Like Everyday in 2000–2001. In that period Shadi got married and herself faced the burden that marriage in a traditional society puts on a young woman’s shoulders. 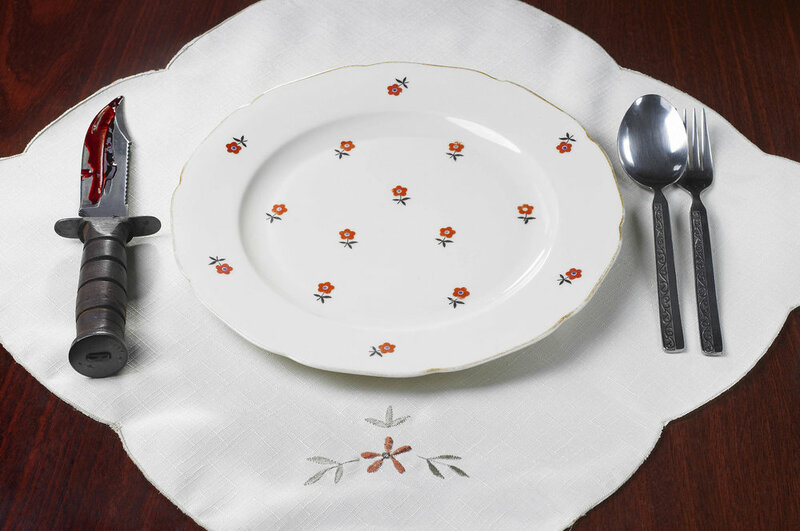 “I realized I had never thought about those things — housewifing things,” said Shadi. “Cups, dishes, irons, sweeping, these kinds of things.” In these pictures she is showing women in chadors with their faces replaced by household objects. The symbolic dissolution of a personality might be seen in the images. Miss Butterfly is another series of the artist dedicated to the Eastern women’s way of living, depicting it in monochrome. Women are shown as butterflies living in a dark cold place with webs that separate them from the rest of the world. 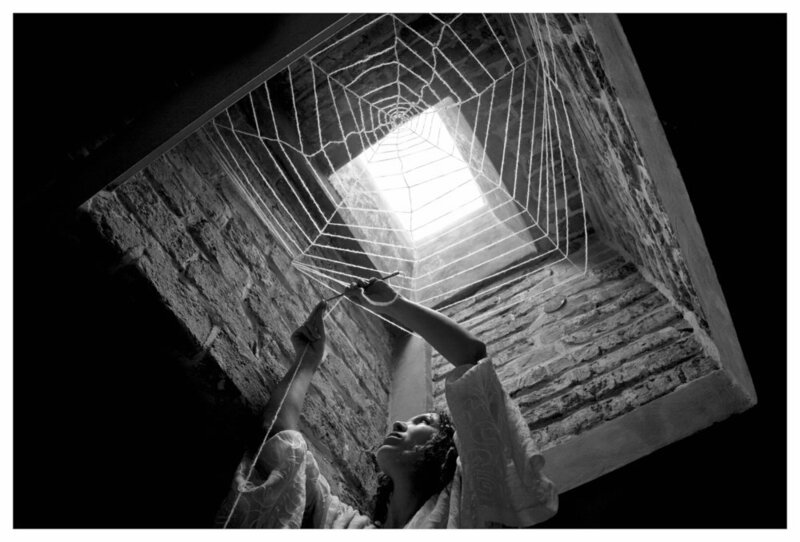 But instead of trying to tear the web apart and fly away, they are tirelessly working to complete it – in the blind obedience to the order of things, or like victims of Stockholm syndrome. Living in one of the most militarised regions of the world, Shadi Ghadirian could not be silent about war, with grief and fears it is bringing to people’s houses. She turned to the subject of armed conflicts in her early works, and this took further development in her later series Nil Nil (2008). In the vast series of works she juxtaposes military objects with the ordinary household pieces, such as utensils or women’s colourful clothes. Again, she is looking at war with the eyes of a woman, who has to face the fear without the direct ability to change things or help her loved ones get back home safe. It is hard to exaggerate how valuable is the position of an artist who speaks out about all that she sees around her with the true artistic honesty and respect to her own roots and traditions.